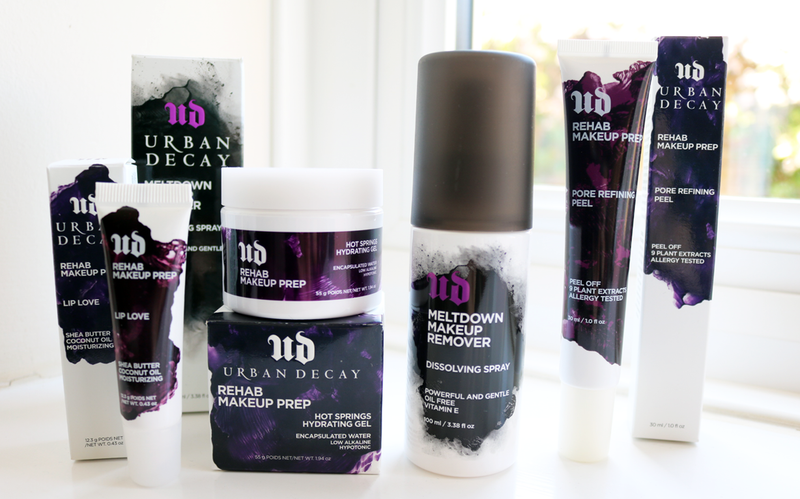 Last month, Urban Decay launched their brand new Rehab and Meltdown ranges, and I've been testing some of the products from these lines out to see what all the hype's about. Aside from their awesome makeup which I've been using for years, two of my all time favourite products from Urban Decay are their All Nighter Setting Spray and the much-loved Eyeshadow Primer Potion. So when I heard that they were releasing a whole range dedicated to the fine art of makeup-prep, I got pretty excited. The new Rehab range has four products in it and I've been lucky enough to get my hands on three of them which I've been diligently testing out recently. In addition to those, I've also been trying out one of Urban Decay's latest must-haves from their new Meltdown range (for makeup removal) as well, so here are my thoughts on these new kids on the beauty block! Lip Love is an intensely hydrating lip balm treatment that comes packaged in a squeezy tube. It's formulated with the likes of Coconut Oil and Shea Butter to deeply nourish and help repair dry, cracked lips, and you can use this as a regular everyday lip balm, before applying any lip product to smooth out any fine lines and dry patches, and/or as an overnight lip treatment. It comes out quite thick (you only need a tiny amount! ), but is quickly absorbed when you apply it to your lips. Whilst it does a great job of creating an ultra smooth canvas before I apply my lipstick, it doesn't really do anything else for me that my other (and cheaper) lip balms do, so I feel it's very expensive for what it is. The Hot Springs Hydrating Gel though is something that I've absolutely been loving! I'm somewhat obsessed with primers, partly due to the fact that I have oily/combination skin so it can sometimes be tricky to get makeup to stay put throughout the day. Some hydrating products are too much for my skin type, but this one is just perfect. The texture of it is like a thick gel in the jar, yet it transforms into a light watery substance once applied onto the skin and is instantly absorbed. It has some clever 'spring water encapsulated technology' that makes it do this, but all I can say is that it feels wonderfully light, cooling and refreshing on the skin. It eradicates any pesky dry patches like around my nose, and it helps to balance the oilier parts of my t-zone so that my makeup keeps on looking good all day. I've tried it on my sister who has dry skin, and it worked well for her too, so I imagine many skin types will like it. A new summer staple for sure! I often use exfoliating peels and face masks before a special occasion to get my skin looking its best, so I was curious to try out this Pore Refining Peel to see how it compares to the skincare products that I already use. This new peel-off mask is aimed at those who want to reduce the size of their pores as it promises to clean out impurities, leaving the skin clearer and smoother, ready for makeup. You need to give the tube a good squeeze to get the product out, and it applies like a clear gel onto the skin. I applied it to my troublesome t-zone area where I get most of my blackheads and left it on for 10 minutes as instructed. When it was time to remove it, I carefully peeled it off and had a good look in the mirror afterwards. To be honest, I didn't notice any difference and there were no blackheads or 'gunk' on the mask afterwards, plus my skin and pores didn't look any clearer than they were before. I think this product might be a better option for those with more sensitive skin who want a very gentle peel-off mask, but I personally found it rather disappointing, as there are lots of similar products that work a lot better for me and are much cheaper too. From the new Meltdown range, I've been testing out the Makeup Remover Dissolving Spray which is a pretty nifty product to use if you love wearing long-wearing and waterproof makeup formulas. It's composed of just three ingredients (two silicone based ones and Vitamin E), and to use it, you just spray it onto a cotton wool pad and it can wipe the most stubborn makeup off within seconds, though it sometimes does require another round with the cotton wool pad for removing all of my waterproof eye makeup. I've also sprayed it directly onto my face (with my eyes closed!) and it's worked just the same. Although it's an oil-free formula, it does have a slightly oily/greasy feel to it when it's on the skin, so I'd recommend following this up with a good cleanser afterwards to get your skin thoroughly clean after you've removed all of your makeup with this. I love how quick and easy this spray is to use - now there's no excuse not to take off your makeup when you come home late! 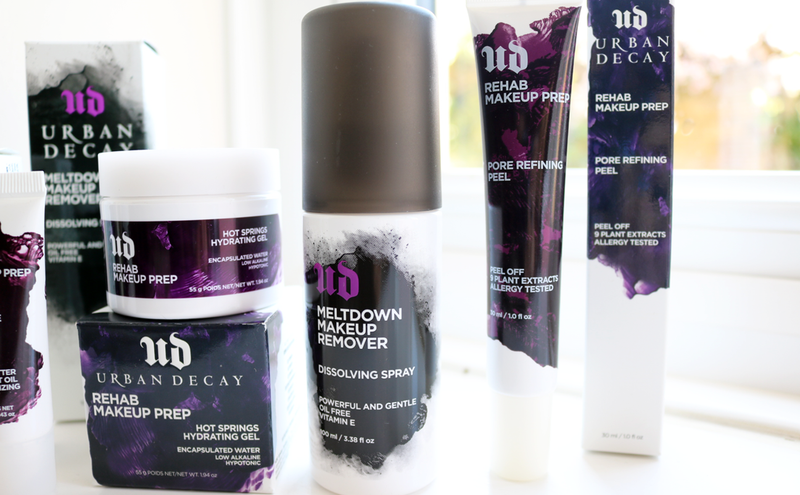 Have you tried any of these new products from Urban Decay? 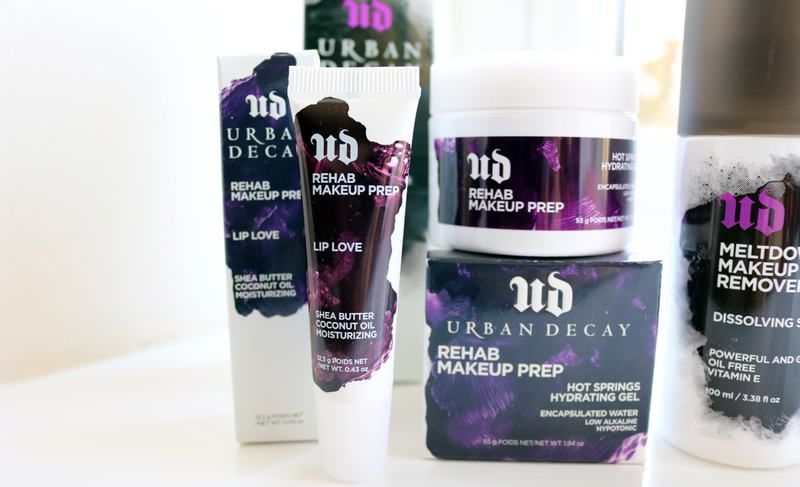 This is such an interesting launch from Urban Decay! Love the sound of the hydrating gel!